RESULTS: WWE Smackdown Live Results - Aiden English's Shocking Lana Evidence Revealed!!! - Paige makes her way to the ring and is irate with Samoa Joe's 'dastardly' behavior last week. Paige confirms that Styles' family is OK; but, charges were pressed against Samoa Joe, whom management recommends to release. Paige spoke with Styles, who dropped charges and begged Paige not to fire Samoa Joe. Paige relented and confirmed that the match between the two at Super Show-Down will continue. She plays a clip of Styles, who isn't at Smackdown Live. 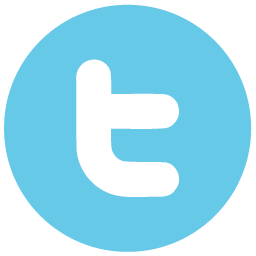 He apologizes to the audience for his inability to perform due to current given circumstances. Styles is also afraid to do something he may regret and refuses to leave his home until he gets confirmation that Samoa Joe is on a plane to Australia. Instead Styles reiterates that he will be committed to protecting his family. He promises, "Joe, this is going to end. This needs to end. You're not coming back from the Land Down Under because that's exactly where I'm gonna put you and I'm not talking about taking your body, putting it in a casket and shoveling some dirt on it. I'm talking about burying you alive." - Paige is confronted backstage by Tye Dillinger, who wants a match with Randy Orton and Paige grants his request. The two will have a match tonight. - New Day makes their way to the ring to make pancakes with Mr. Bootyworth and to also hype their upcoming Super Show-Down title defense against The Bar; but, The Bar interrupts the segment. A brawl ensues with The Bar gaining the clear upper hand before the segment's close. Sheamus and Cesaro then fill Mr. Bootyworth's hat with pancake batter before placing it upon his head. - Tye Dillinger attacks Randy Orton before the match officially begins. Orton eventually traps Dillinger's finger between a turnbuckle and pulls it back to the breaking point. The match never gets underway. - Shelton Benjamin is backstage working out when he is interrupted by The Miz, who tells him he put in a call and secured him an opportunity tonight against Daniel Bryan. Benjamin promises to beat Daniel Bryan; but, The Miz wants a statement. Benjamin says, "Here is my statement. I've been waiting on the bench every week waiting to remind the world just who I am. Daniel Bryan is just unlucky #1." Ohh yeeeaah! The legendary Macho Man Randy Savage is ready to give you his classic flying elbow drop from the top turnbuckle in this Defining Moments action figure! Figure comes packaged in a window box and features amazing detail and likeness of Randy Savage in 6-inch scale. Ages 8 and up. - Lana and Rusev make their way to the ring for Aiden English's big reveal and Rusev says of English, "I want to tear his pale body apart." English makes his way down the ramp and stalls by talking up Milwaukee. He then goes to video which shows him to singing backstage sans a shirt. There is a knock on the door. It's Lana, who tells Aiden English, "I want you." The video then cuts off. 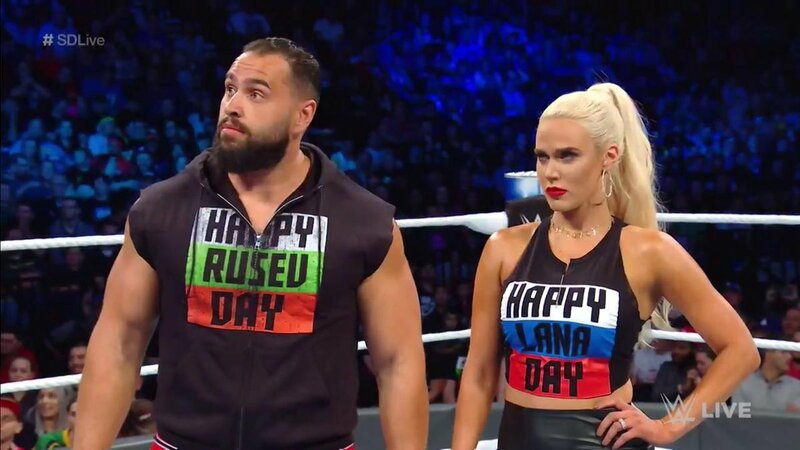 Rusev is dumbfounded looking at Lana and then pointing to the screen. English says he'd like to show the rest; but, can't due to legal reasons. He is entertaining an offer from TMZ and wouldn't want to cheat on them. Lana talks to Rusev off the microphone and can be heard saying, "That's not all of it." 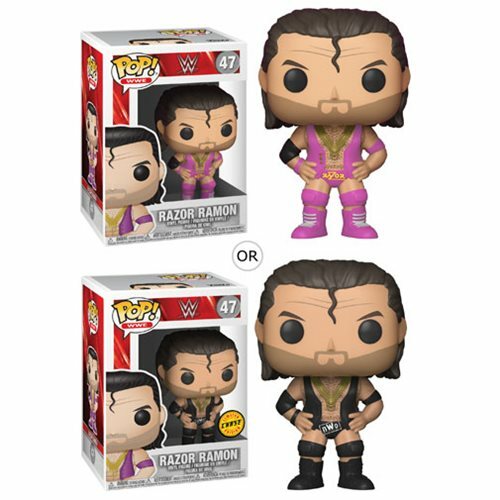 Rusev says, "There's more?" He then proceeds to chase after Aiden English. - Rusev is backstage looking for Aiden English when he is confronted by Lana, who wants an opportunity to explain. Rusev replies, "We are not doing this here." - Shelton Benjamin defeats Daniel Bryan via pinfall *The Miz, who is on commentary, runs distraction. Postmatch: The Miz attacks Daniel Bryan, specifically targeting Bryan's ribs, which were apparently hurt during the match. - Becky Lynch makes her way to the ring and talks about how she isn't on enough posters. She isn't on the Super Show-Down poster. She has a re-designed a new poster that features only her. Charlotte makes her way to the ring and the two brawl. Lynch is the recipient of a Charlotte Flair spear. Charlotte then tosses Becky Lynch into the poster and locks the figure four onto Lynch. Flair then super kicks Lynch.